Kenzi (aka Lisa Butterworth) traces her passion for henna to the time she spent living and working in Morocco. Her travels throughout Morocco and elsewhere in the world have instilled in her a deep curiosity and appreciation for cultures, arts, traditions, and history. A self-taught professional henna artist, Kenzi’s love of Moroccan design is reflected in her henna work, into which she also incorporates traditional and contemporary influences from other cultures. While Kenzi’s style is deeply rooted in tradition, it is also entirely modern, often referred to as “psychedelic amoeba.” Kenzi’s experience is as vast as her influences. Her work has been seen in films (Spike Lee’s The 25th Hour; Jonathan Demme’s The Manchurian Candidate), on television (Erykah Badu’s MTV video “Love of my Life”), in magazines (a spread on Global Beauty for Brides Magazine), and on the runway. She works at large-scale corporate events and festivals (Bulgari, HBO, A&E TV, New York University, Whole Foods Market, Diabetes Research Institute, Committee to Support Rural Education for Girls in Morocco (“CSSF”)) as well as intimate weddings and parties. 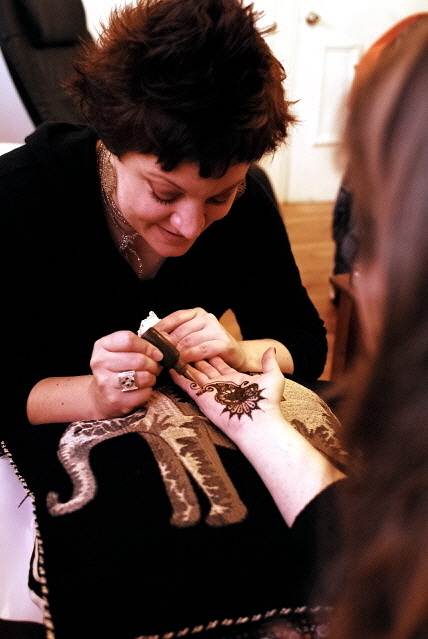 Kenzi also offers private consultations and teaches the art of henna in workshops throughout New York City and around the world. Kenzi is the creator, producer and host of the Caught Red-Handed, a podcast by, for and about henna body art. You can read more about the podcast on the blog or subscribe to it on iTunes. Kenzi is the author, along with Nic Tharpa Cartier, of the first ever book on Moroccan henna, "Moor: A Henna Atlas of Morocco" and is currently lecturing across the country and around the world on the subject of Moroccan henna. She and Nic (among others) are starting work on their next project. Watch this space for new creative developments!